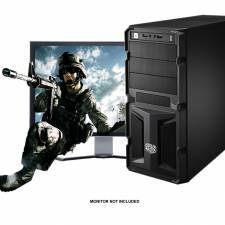 *High Performance Gaming Barebones PC* - Intel Core i5 3.0Ghz Haswell chipset 8GB DDR3 memory is installed all built in the Coolermaster Midi chassis powered by a 650W Power Supply. Introducing the High Performance Barebones PC. Based around the NEW Intel Core i5 4th generation Haswell processor! Comprising in a stylish Coolermaster Midi Tower Case with USB 3.0, Intel chipset motherboard, Intel Core i5 3.2Ghz Quad Core Processor installed with a CPU Cooler, 8GB DDR3 memory, all powered by a 650W Power Supply. Please note: These Barebones bundles are assembled on demand to order and usually ship within 48hrs of the order being placed. During busy time periods these can increase upto 72 hours.